The highly-anticipated 2015 WRX has arrived this week in LA and it made it’s global debut with new upgrades not seen before in the performance model. The all-new 2015 Subaru WRX is coming with new high-tech upgrades and new user technologies that give the new WRX a more refined feel. They in no way take away from the performance attitude of the WRX, but only enhance the performance sedan’s personality. The WRX is growing up and growing high-tech. The 2015 WRX grows up and gets bigger with a roomier interior, upgraded cabin comfort and materials and a wide array of new user technologies. A big change is seen with its one-inch longer wheelbase over the previous-generation WRX. This gives the WRX a roomier and more comfortable cabin. Can you hear taller performance enthusiasts shouting for joy? The high-performance and high-tech upgrades can be seen in the new flat-bottom, leather-wrapped steering wheel. It features tilt/telescoping adjustments and integrates switches for audio and Bluetooth control. A harman/kardon premium audio system is also offered for the first time in a WRX. The interior gets a new modern feel as there are more soft-touch materials used in the new WRX cabin that ever before. And the available power sunroof opens one inch farther than on the previous WRX. The high-tech features continue with the new dual gauge instrument layout that features a 3.5-in. LCD central screen. It displays various functions, including oil and washer fluid levels, and selected gear ratio. It also gets a new multi-information central display with 4.3-in. LCD screen that provides a multitude of vehicle system functions. It includes a rear camera display, boost gauge display, audio, Bluetooth and climate control settings, and a VDC screen showing traction control operation. The new display can provide a vehicle self-check and maintenance reminder. 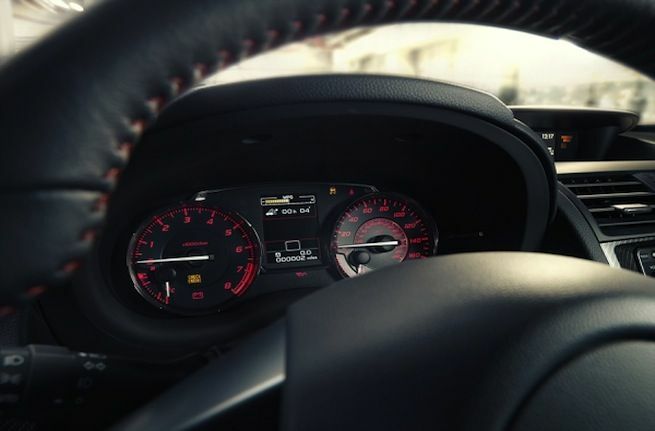 There are more upgrades inside that improve the refinement level of the new WRX. It gets new whiplash-reducing high-grip fabric covered front sport seats, featuring separate tilt- and height-adjustable head restraints. These are new from the seat-integrated head restraints used before. Leather is also available, as is an 8-way power driver’s seat. Other refinements inside include standard automatic climate control and available Keyless Access with Push-button Start, heated front seats, and a 440-watt, 9-speaker harman/kardon premium audio system and navigation with Aha smartphone integration. The larger premium cabin gets higher seating hip points, lower side sills and wider-opening doors that make getting in and out easier. It also features two more inches of legroom for passengers in the back and trunk capacity is increased. A 60/40-split fold-down rear seat comes standard and improves the WRX sedan’s versatility. Outside, the upgrades continue with the use of new LED low-beam headlights for higher-grade models, with halogen lights being used on other models. At the rear, LED taillights, a diffuser, and LED center high-mount stop lamp (CHMSL) are now used. The all-new 2015 Subaru WRX has grown up with the new larger cabin, new high-tech upgrades and new user technologies. The new-generation WRX is more beautiful and refined inside, but underneath, it’s still a performance beast.